Congratulations to Norine Kelsey, RN, of St. Peter’s Cardiac Rehabilitation and Wellness! Norine was presented with the American Heart Association’s Donald Led Duke Heart Hero Award at the 36th Annual Capital Region Heart Ball on Saturday, March 2. Michael Finegan, president of acute care for St. Peter’s Health Partners, had the honor of chairing this year’s event, held at the Hall of Springs in Saratoga. The Capital Region Heart Ball brings together the community’s most influential leaders from the corporate, philanthropic, and medical communities to raise funds and promote the lifesaving work of the American Heart Association (AHA). This year, the event recognized the vital role that nurses play in cardiac care. Kelsey, a nurse for nearly 50 years, was honored with the Heart Hero Award for her dedication and decades of providing high quality, compassionate care to her cardiac patients. Four of her colleagues received honorable mentions for their extraordinary care and contributions to nursing: Nichole Berkery, BSN, RN, of St. Peter’s Hospital; Robert Dobski, BSN, RN of St. Peter’s Hospital; Rita Nelson, RN, PCCN, of Samaritan Hospital; and Paula Romeo, RN, of St. Peter’s Hospital. Albany County District Attorney and heart attack survivor David Soares was also honored at the event. Soares had quintuple bypass surgery at St. Peter’s Hospital in 2016. He shared his story with the 425 guests, and spoke about the life-saving care he received from the entire St. Peter’s cardiac team, including its many highly skilled nurses. 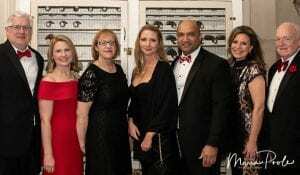 The 2019 Capital Region Heart Ball raised more than $300,000 for the AHA to help fund research and community education programs. You can view a photo gallery from the event on the SPHP Facebook page.